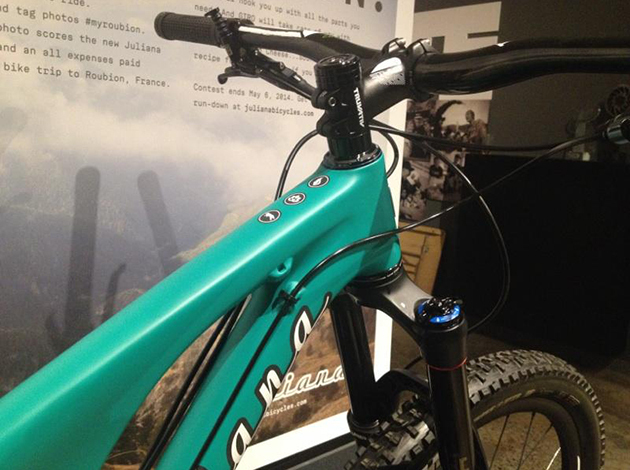 We got our first look at the new Juliana Roubion from Juliana Bicycles at the company's headquarters in Santa Cruz on Tuesday evening. 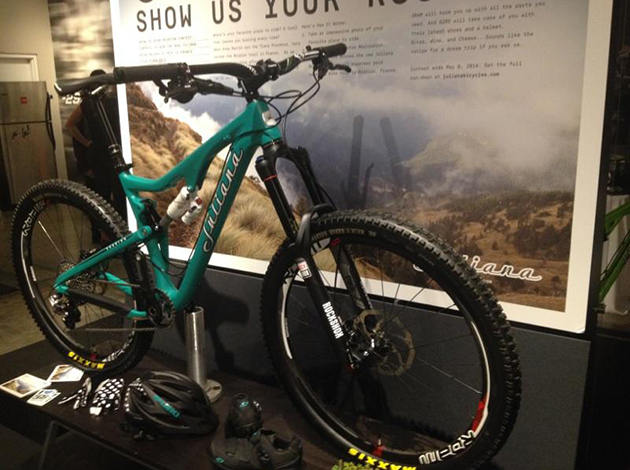 The bike uses the same frame as the popular Bronson, the all-mountain machine made by Santa Cruz Bicycles, Juliana's parent company. This is good news for us ladies. With 6 inches inches of travel build around the trusted VPP platform, 27.5-inch wheels and a 67-degree headtube angle, the Bronson is sweet, up-for-any-terrain ride so the Roubion should be too. 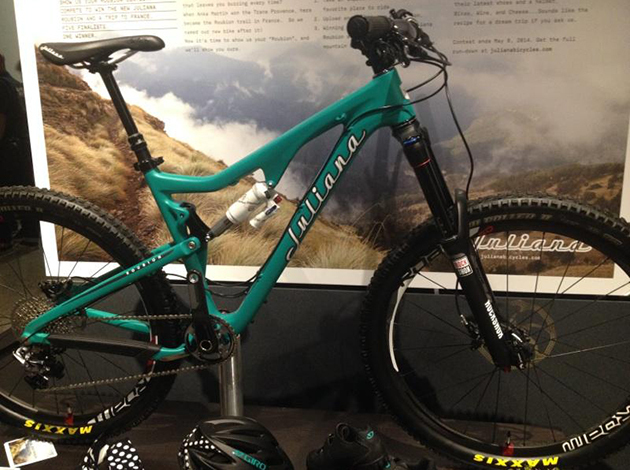 This is the seventh bike under the Juliana brand, which launched a year ago, spawning from the original Juliana bike¬–the namesake of Juliana Furtado–that first entered the Santa Cruz line in 1999. The bike on display here belongs to Juliana sponsored rider, and all-around enduro badass Anka Martin so it was kitted out in full SRAM outfit including XX1 drivetrain and a Pike fork. 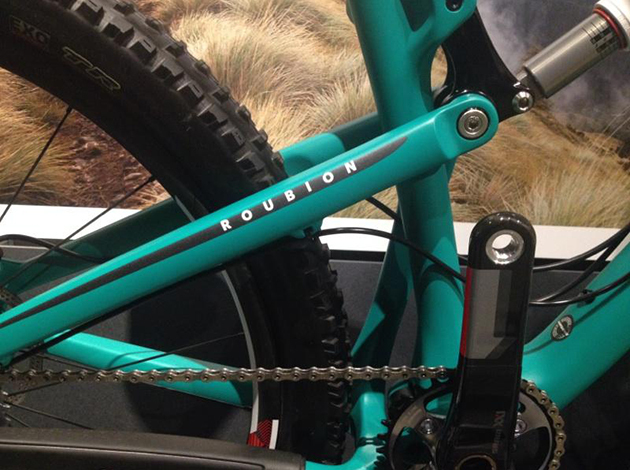 The actual Roubion builds won't be announced until the bike is officially launched next month, said Katie Zaffke, Juliana's brand manager. The Roubion name comes from Martin's favorite stage of the Trans-Provence multi-day race in France, where, last year, Martin won a stage riding a disguised version of the Roubion. Juliana Bicycles is offering one person a chance to ride the new Roubion on a guided Trans-Provence adventure in France this spring. For details and to enter go to julianabicycles.com/myroubion/.